Rulers with quarter- and half-inch measurements, enough for each pair of students in class. Students will be able to measure to the nearest quarter-inch and organise the data using a line plot graph. While students are talking, on the same line as ‘eye-colour,’ write other eye colors like: Light brown, dark brown, blue, hazel, and green. In a roll call fashion, have your students call out their eye colors by rows, tables, or groups. As they do, mark an ‘x’ above each colour you hear until you every student has answered. Add any colors to your row that you may have left out. Explain to your students that the graph you have just created is called a Line plot, another way of organizing data in visual form. Point out how the data uniquely collected from each student represents an ‘x’ on the graph. Have your students turn and tell a neighbour the colour of shoes they are wearing (predominantly). Repeat the roll call style of collecting data of shoe colour until you have replicated the first line plot format and all students have responded. Reflect on the two data organizers and discuss whole class how they are alike and how they are different. Explain how today’s exercise will share some of the same differences and likenesses. 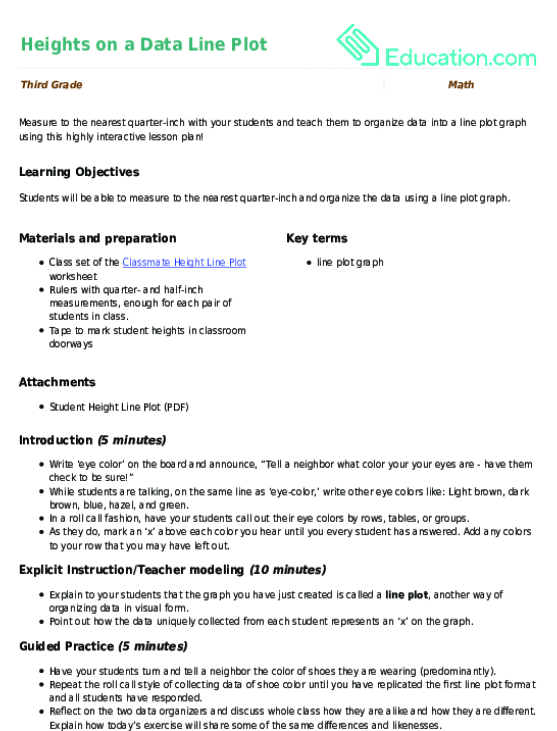 Hand out and preview the Student Height Line Plot worksheet. Preview a strategy for taking student height measurements. Using a doorway is a great place to have students stand while a partner puts tape and their name on the surface. Students are to measure and record the height to the nearest quarter-inch. Remind students how to measure from 0 on a ruler when taking measurements. 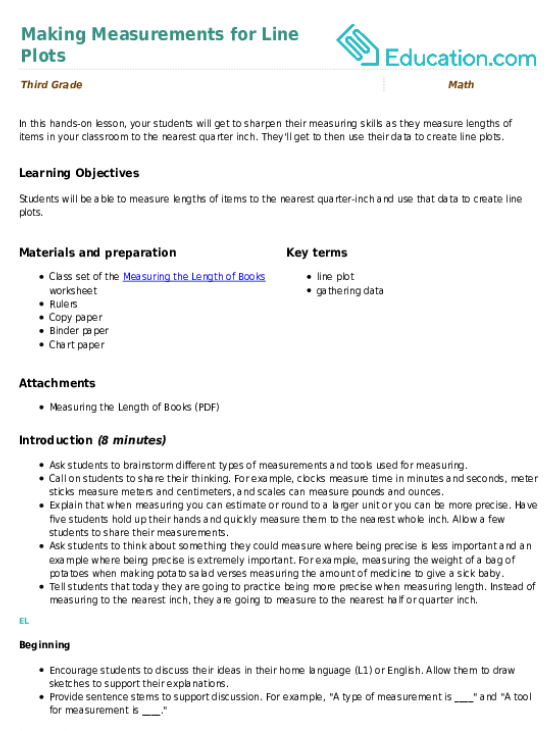 Release students to gather information on student height and complete the Student Height Line Plot worksheet. Although students may work in pairs, allowing each student to be responsible for their own worksheet promotes engagement and personal accountability. Support:Have a class teacher’s version of a poster where students can contribute data as they finish. This is a great task for early finishers and a great reference for less social students. Show your students a card with three different heights and ask them to show you where the heights would be located on their data organizer. Reinforce the notion that they must categorize heights to the nearest quarter-inch. Have students put their work on their desk, stand quietly, and do a silent ‘gallery walk’ around the class to view one another’s work. After everyone has had a chance to see all the work, have your class return to their seats. Discuss what was consistent, inconsistent, and generalizations you can make about your line plot data. Using this resource, your class will measure and graph their each other's heights with a line plot. Using this resource, your class will measure their classmates' foot sizes and graph the data on a line plot. They'll get to then use their data to create line plots. Support your students as they collect, organise, and discuss measurement data! Use this lesson independently or alongside *Making Measurements for Line Plots*. 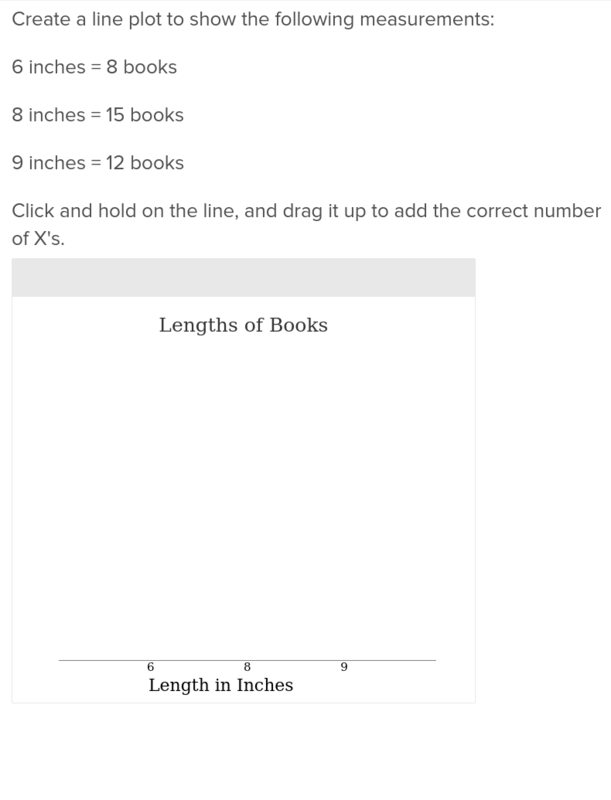 Use this worksheet to give your students practise measuring books to the nearest quarter of an inch and an opportunity to turn their data into a line plot. 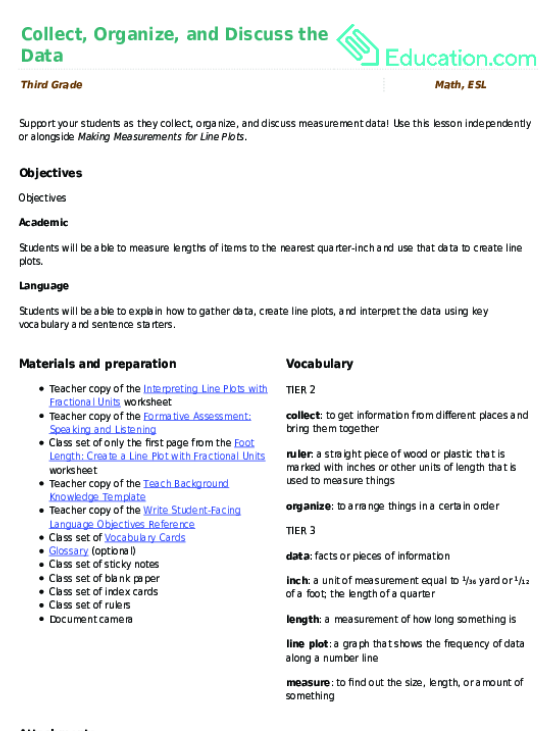 Use this glossary with the EL Support Lesson: Collect, organise, and Discuss the Data. Use these vocabulary cards with the EL Support Lesson: Collect, organise, and Discuss the Data.